Matcha flavored mochi bars, while perhaps not considered traditional Japanese mochi, are nevertheless delicious and addicting. The texture is chewy, gooey, and sweet with a hint of matcha. 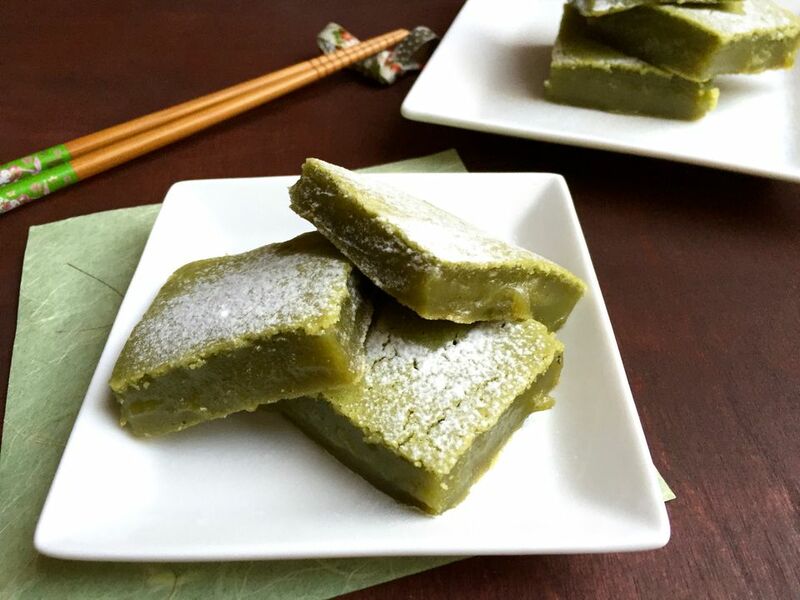 The matcha flavor of these mochi bars is a result of adding culinary grade matcha powder to the batter. While the recipe calls for two tablespoons of matcha, I encourage you to add up to 2 1/2 tablespoons for more flavor. Dust the mochi with a touch of powdered sugar for aesthetics and a little extra sweetness. This mochi bar recipe is great for parties and potlucks. Fresh out of the oven, these mochi bars also have an unexpected crust which contrasts the chewiness of the mochi with a delightful baked crunch. These mochi bars are best enjoyed on the same day that they are baked, especially if you'd like to experience that delicious fresh baked crust. Note that if the mochi bars are not enjoyed on the same day they are baked, they may be refrigerated and reheated but the fresh baked crust will have softened by then. In a large bowl, combine coconut milk, water, vanilla extract, and sugar. Using a hand mixer, mix until sugar is well incorporated and somewhat dissolved. Add baking powder and slowly add mochiko (sweet rice flour) about 1/2 cup at a time, mixing well each time. As you continue to add more mochiko, the batter will thicken. After all the mochiko has been mixed in, add 2 1/2 tablespoons matcha powder and incorporate well. Using a spatula instead of a hand mixer works fine, too. Spray a 9-inch by 13-inch oven safe glass baking dish with canola oil cooking spray. Coat well to prevent the baked mochi from sticking to the baking dish. Bake mochi in preheated oven for 1 hour until the ends become browned and chewy. Allow the mochi to cool to room temperature. Using a plastic knife or a ceramic knife, cut the mochi into large squares (this prevents mochi from sticking to the knife). Dust mochi with powdered sugar. It is best if enjoyed immediately while the crust is fresh! If needed, mochi may be stored in an airtight container in the refrigerator. Mochi stored in the refrigerator tend to become hard and should be warmed in a microwave before eating.